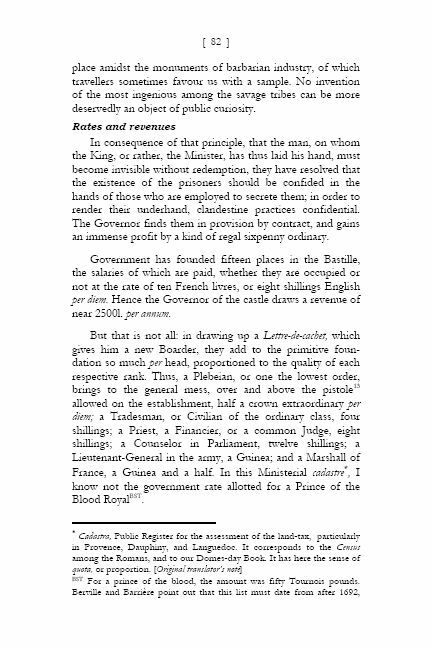 Like most prisons even today, the Bastille banned sharp objects. So Linguet's indignation on this point may be unreasonable. But his amusement at one result of it is easy to share. ....at the end of about eight months, I conceived the idea of eluding the tedious hours of my confinement by a recollection of my past mathematical studies. 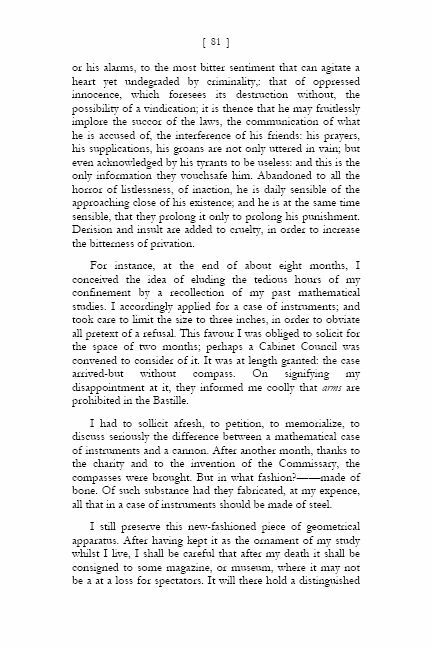 I accordingly applied for a case of instruments; and took care to limit the size to three inches, in order to obviate all pretext of a refusal. This favour I was obliged to solicit for the space of two months; perhaps a Cabinet Council was convened to consider of it. It was at length granted: the case arrived-but without compass. On signifying my disappointment at it, they informed me coolly that arms are prohibited in the Bastille. I had to sollicit afresh, to petition, to memorialize, to discuss seriously the difference between a mathematical case of instruments and a cannon. After another month, thanks to the charity and to the invention of the Commissary, the compasses were brought. But in what fashion?——made of bone. Of such substance had they fabricated, at my expence, all that in a case of instruments should be made of steel. I still preserve this new-fashioned piece of geometrical apparatus. After having kept it as the ornament of my study whilst I live, I shall be careful that after my death it shall be consigned to some magazine, or museum, where it may not be a at a loss for spectators. It will there hold a distinguished place amidst the monuments of barbarian industry, of which travellers sometimes favour us with a sample. No invention of the most ingenious among the savage tribes can be more deservedly an object of public curiosity. If page images do not appear below, you may need the Acrobat reader. Check too if your browser is disabling any add-ons. To purchase and download this book NOW, click HERE. Please do not reproduce, extract or post elsewhere without prior permission.